When we imagine our ideal holiday, some of us think of staying somewhere that has a swimming pool and sauna because we find swimming and steaming in a sauna physically and mentally satisfying. It is holiday accommodation at the high quality end of the market that features these desirable leisure facilities and since we aim to have a wonderful time on holiday - we are prepared to pay that little more for our personal indulgences. Click on the page headings to display a list of good quality self-catering accommodation in the UK with a sauna and swimming pool. We all try to squeeze the most value from our holiday provision and really need to ensure that whatever holiday is booked, lives up to expectations. For that reason it is good to make a Wish List for a holiday to define what would make us happy rather than book something at random and have regrets. Begin with the essential items such as the number of bedrooms required and then move on to the facilities such as a swimming pool and sauna that are important to you personally. You may wish to find out whether the swimming pool is indoor, outdoor, the temperature of the water and the capacity of the sauna. 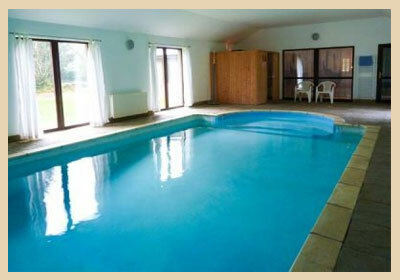 There is a good number of holiday lets that offer both a pool and sauna or steam room in the UK. You may also wish to extend the criteria to pet-friendly, have a BBQ, fenced garden and anything else that applies. It is virtually impossible to find the absolute ideal set of criteria and location but at least knowing what you would like is a good start. Sign up to our mailing list to receive infrequent information about holiday cottages with a sauna as well as a swimming pool. © Copyright cottageswithswimingpools.co.uk. All Rights Reserved.